Finally. When I went out to the garden today I realized it was the day I had been waiting on for months. 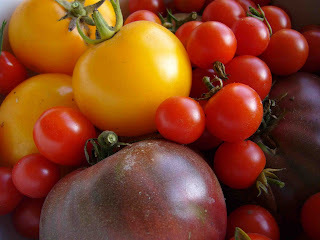 Today I was able to pick a bowlful of full-size, ripe tomatoes to go along with the cherry tomatoes that I've been pulling off the vines for a few weeks now. I cannot wait to start using these in recipes, BLTs and simply sliced up with a little salt. I love this time of year. oohh those tomato's look so delicious!